Mack Horton wrangled up the men’s 1500m freestyle qualifying time tonight in Brisbane. Bronte Campbell doubled up on her 100m freestyle victory and stole gold in the splash n’ dash tonight in Brisbane. 16-year-old Ariarne Titmus scored her 2nd national title at the 2017 Australian Swimming Championships, clocking a new 400m freestyle age group record in the process. The Campbell sisters will try to land upon the podium once again, taking on the 50m freestyle tonight in Brisbane. Two of the 3 podium members from the 100m breaststroke earlier in the meet found themselves with more hardware in this 200m distance, led by now double national title-winner Taylor McKeown. The 22-year-old Olympian managed to hack 3.15 seconds off of her speedy morning swim to clock a mark of 2:23.58 for the victory tonight in Brisbane. The USC Spartans’ outing now ranks as the 4th fastest time in the world this season. The USC Spartans swimmer is Australia’s defending national champion in this race, having won the 2016 title in a time of 2:21.45. Unfortunately for the green and gold, McKeown wasn’t able to replicate that performance once in Rio, despite throwing down a semi swim of 2:21.69. She would wind up 5th overall in the final, earning a time of 2:22.43. However, McKeown didn’t come away entirely medal-less, as she was a member of Australia’s silver medal-winning 4x100m medley relay. Silver medalist in the 100m distance here in Brisbane, Jessica Hansen, settled for bronze in the longer race, stopping the clock at 2:30.62. Tessa Wallace of Pelican Waters was tonight’s silver medalist in a mark of 2:25.45, the 10th fastest result of her career. Wallace soared to 2nd place from 4th in prelims. No woman was able to notch the Aussie-mandated QT in either breaststroke distance at these championships, which means no swimmer will be automatically selected to Budapest. 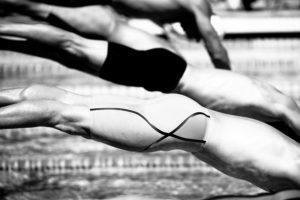 If a breaststroker were to make the squad, it would be by way of discretionary selection. 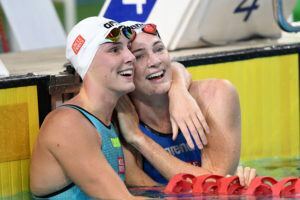 While some Olympians at this meet are falling a little flat, a lá Mitch Larkin and Madi Wilson, Australian backstroking legend Emily Seebohm has been flourishing. Qualifying for her 2nd individual event for Budapest after claiming gold in the 100m back earlier in the meet, the double world champion topped the podium in this longer distance, throwing down a super quick 2:07.03. That time now overtakes Canada’s Kylie Masse and Russia’s Daria Ustinova to sit upon the world rankings throne in this event. Seebohm’s outing tonight checks-in as the 9th best performance in Australian swimming history, with all of the top 10 results ever shared now only between Seebohm and 2016 national title winner Belinda Hocking. Hocking retired after Rio, giving Seebohm an opportunity to clinch the 100m/200m national title double for just the 2nd time. 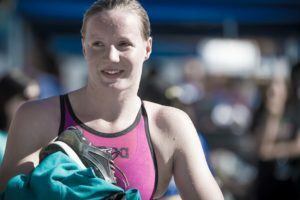 Also with her victory tonight, Seebohm just collected her 20th national title. That’s just simply incredible. Not to be overlooked in the race, however, is the fact that 15-year-old USC Spartans athlete Kaylee McKeown just blasted a huge personal best to clear the Aussie-mandated QT and make her first senior World Championships squad. Entering the meet, McKeown’s personal best was the 2:09.18 from last month’s NSW Championships, but McKeown took things down to the sub-2:09 level for the very first time, stopping the clock at 2:08.98 for silver. Remarkably, even as quick as her race was, McKeown’s time still falls short of the 15-year-old age group record of 2:08.00. That age group record is held by now-16-year-old Brisbane Grammar star Minna Atherton, who looked promising with a 2nd seed out of prelims, only to finish 5th overall in 2:11.32. Bronze tonight went to Melbourne Vicentre’s Hayley Baker, who touched in 2:09.26 to finish just .10 over the Aussie QT, showing how fast the top tier of this race really was. David Morgan of TSS Aquatics just became the men’s 200m butterfly national title holder for the 2nd consecutive year. We speculated it would take almost a lifetime best swim for Morgan (or any other competitor) to clear the Aussie-mandated, stiff World Championships QT of 1:55.75, and that’s just about what it took for the 2016 Olympian to claim his 2nd individual title of the meet. Topping the field tonight in a speedy 1:55.70, the 23-year-old just scored the 2nd fastest performance of his career and the 9th fastest performance in Australian history. Last year, an Olympic year no less, Morgan clocked 1:55.63 to make the team, so his Budapest-qualifying outing tonight was only.07 off of that career-best feat. Morgan missed qualifying for the 100m butterfly earlier in the meet by just.3. Runner-up was Grant Irvine, who touched in 1:56.05, while the rest of the field, including bronze medal winner Nicholas Brown (1:58.43) fell off into the 1:58 zone and beyond from that point. Although Irvine doesn’t qualify for Budapest, he does now enter the world rankings at #9. All but one of the 8 finalists in the men’s 400m IM dropped notable time from their morning swims, led by 19-year-old Clyde Lewis. Lewis already threw down the win in the 200m IM and now doubled up on that victory with his 4:18.60 time tonight to take the grueling 400m edition. Although his best time checks in at 4:16.58, tonight’s performance ranks as #2 within the St. Peters Western swimmer’s young career. Lewis is red-hot this meet, having already also collected a bronze in the 200m backstroke. Just .25 behind Lewis was Chandler athlete Jared Gilliland, who finished in 4:18.85 for silver. Ironically, Gilliland’s personal best ties that of Lewis at 4:16.58, so he would have had to produce the swim of his life to notch the stiff Aussie QT of 4:15.47 to get to Budapest. Bronze tonight went to new Marion Swimming Club athlete Travis Mahoney with his mark of 4:19.10. That hacked almost 6 seconds off of his prelims effort, but falls well outside of the 4:13.37 and 4:15.48 outings he produced in Rio in peak athletic and training shape. In the marquis race of the night, the fastest 100m freestyler ever in a textile suit, Cameron McEvoy, was pitted against the young gun gold medalist in the event, Kyle Chalmers. The 22-year-old Bond swimmer came out on top, as McEvoy claims the world’s first 47-point time of the season. Splitting 22.27/25.18, McEvoy nailed an impressive 47.91 to top the world rankings, his domestic field and earn his 2nd individual roster berth for Budapest. 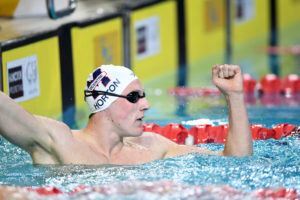 He already won the 50m freestyle decisively in a world-topping 21.55. Chalmers also scored a qualification mark, touching in a solid 48.20, the 5th fastest outing of his young career. Given the fact the Marion star was too sick to swim the entire NSW Championships last month, the Rio hero can consider the job done in Brisbane. He now sits as the 2nd fastest swimmer in the world this season. FYI, this is the 2nd 100m freestyle race in a row where Chalmers has produced a comparatively slow reaction time of .71. McEvoy was .62, while Louis Townsend was .58, so the 18-year-old hulk would benefit from a quicker blast off the blocks. 18-year-old Jack Cartwright impressed yet again, dropping his personal best down from 48.91 to 48.81 in prelims, then down almost another 4/10 down to 48.43. 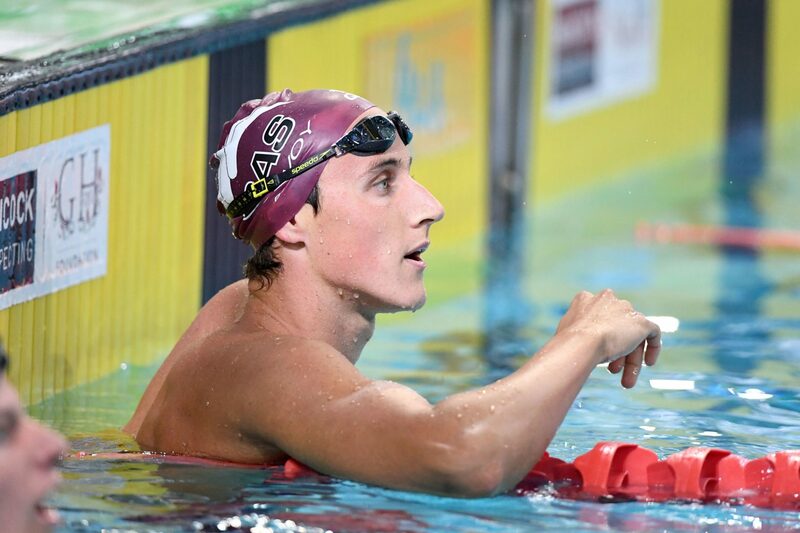 Splitting 23.52/24.91, Cartwright dipped under the quick 48.49 Aussie-mandated QT for Budapest and just earned a slot on his nation’s World Championships 4x100m freestyle relay. The rising sprint ace now sits as 3rd fastest in the world rankings. Remember, Cartwright does have international racing experience having won gold in this event at the 2016 Junior Pan Pacific Championships. 4th place went to West Coast’s Zac Incerti, who also reaped a big time drop to finish in 49.03 for probably relay selection. In a field of just 7 swimmers during this morning’s prelims, open water swimmer Kareena Lee took the 1500m freestyle timed final win in a time of 16:26.46. She was followed by Mikayla Messer and Madelein Gough, who touched in 16:29.24 and 16:32.17 for silver and bronze, respectively. Anyone else noticed Mitch Larkins backstoke break in kick on the left side. Is this something he has always done does anyone know? I noticed that – perhaps he has an injury . It is always been there, see the olympic finals. Xu jiayu, the silver medalist in rio has just swum a 51.86 in the 100 bakstroke at the Chinese trials. New Chinese national record. Looks like ryan murphy has a new rival. I would like to see what xu does in the 200 back later this week. Sun yang clocked a 1:44:9 in the 200 freestyle. Another gorgeous backstroke, like Irie, only faster. That was a beautiful swim. ? While Murphy moves water with his physicality, Xu Jiayu moves water by fighting less water and submerged less.